Aitor Karanka suffered defeat in his first game as Middlesbrough manager as a Jason Pearce header earned Leeds a fourth successive win. The former Real Madrid assistant manager saw goalkeeper Jason Steele sent off in the first half, before Ross McCormack put Leeds ahead. Mustapha Carayol finished smartly to bring the 10 men level, but Pearce quickly restored the home advantage. The win moved Brian McDermott's side into the Championship play-off places. Ex-Real Madrid defender Karanka, who also spent three years as Jose Mourinho's number two at the Bernabeu, described his arrival at Middlesbrough as a new era. But hopes of a winning start and just a third Middlesbrough victory in 14 outings were dealt a blow when McCormack netted his ninth goal in seven matches. The 27-year-old pounced on a header across goal by team-mate Tom Lees to head home from close range for his 13th goal of the season. The Scot had been frustrated when two penalty appeals were turned down, but his goal and the decision by referee Philip Gibbs to dismiss Steele gave Boro an uphill challenge. Steele saw red for fouling McCormack's strike partner Dexter Blackstock outside the area, prompting the introduction of substitute goalkeeper Jayson Leutwiler at the expense of striker Marvin Emnes. Boro are yet to beat a side above them in the league this season, but rallied in the second period and levelled when Carayol swept past Paddy Kenny after a defence-splitting pass by Albert Adomah. Leutwiler pulled off a superb diving save from Alex Mowatt but could not deny Pearce minutes later when he leapt to head home captain Rudolph Austin's cross. Mowatt and Austin both went close late on, as Boro were consigned to their third consecutive away defeat. "Sometimes you are better playing against 11 men. We have found that in the past. It is psychologically harder against 10. "We couldn't get that third goal but the result was the most important thing. "It's good to be in the top six but I would rather be even higher. There is much more to come from the team." "It would have been better if we had won, but I am happy because we played very well in the second half when we were down to 10 players. "I have had just 10 days with the players but they have shown a good attitude and with that we can build. "Even so, there may be changes for the next game, depending on what I see on the training ground." Match ends, Leeds United 2, Middlesbrough 1. Second Half ends, Leeds United 2, Middlesbrough 1. Attempt missed. Alex Mowatt (Leeds United) left footed shot from outside the box is too high. Assisted by Ross McCormack with a cross. Attempt missed. Rodolph Austin (Leeds United) right footed shot from the left side of the box is close, but misses to the left. 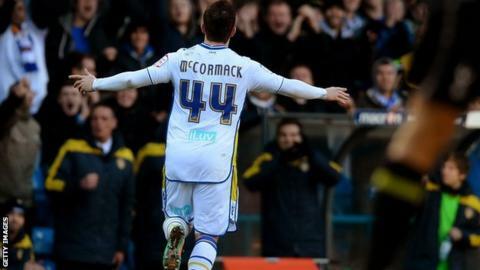 Ross McCormack (Leeds United) wins a free kick on the right wing. Attempt saved. Lukas Jutkiewicz (Middlesbrough) left footed shot from outside the box is saved in the top left corner. Assisted by Albert Adomah. Foul by Frazer Richardson (Middlesbrough). Rodolph Austin (Leeds United) wins a free kick on the left wing. Foul by Kei Kamara (Middlesbrough). Sam Byram (Leeds United) wins a free kick on the left wing. Substitution, Leeds United. Michael Brown replaces Luke Murphy. George Friend (Middlesbrough) is shown the yellow card for a bad foul. Foul by George Friend (Middlesbrough). Marius Zaliukas (Leeds United) wins a free kick in the defensive half. Jonathan Woodgate (Middlesbrough) is shown the yellow card for a bad foul. Foul by Jonathan Woodgate (Middlesbrough). Ross McCormack (Leeds United) wins a free kick in the defensive half. Albert Adomah (Middlesbrough) wins a free kick on the right wing. Foul by Matt Smith (Leeds United). Grant Leadbitter (Middlesbrough) wins a free kick in the attacking half. Substitution, Middlesbrough. Lukas Jutkiewicz replaces Richard Smallwood. Substitution, Leeds United. Sam Byram replaces Danny Pugh because of an injury. Substitution, Leeds United. Matt Smith replaces Dexter Blackstock. Attempt missed. George Friend (Middlesbrough) right footed shot from outside the box is high and wide to the right. Assisted by Richard Smallwood. Curtis Main (Middlesbrough) wins a free kick in the defensive half. Foul by Luke Murphy (Leeds United). Albert Adomah (Middlesbrough) wins a free kick in the defensive half. Attempt missed. Rodolph Austin (Leeds United) header from the centre of the box is close, but misses to the right. Assisted by Luke Murphy with a cross. Attempt saved. Alex Mowatt (Leeds United) right footed shot from the centre of the box is saved in the centre of the goal. Assisted by Danny Pugh with a cross. Offside, Middlesbrough. Frazer Richardson tries a through ball, but Albert Adomah is caught offside. Lee Peltier (Leeds United) wins a free kick in the defensive half. Substitution, Middlesbrough. Curtis Main replaces Mustapha Carayol. Danny Pugh (Leeds United) is shown the yellow card for a bad foul. Foul by Danny Pugh (Leeds United).